Pulses provide a valuable source of fibre and are a useful source of zinc, which is essential for maintaining a strong immune system. 1. Heat the olive oil in a medium-sized saucepan for 1 minute, add the onion and cook gently without browning for 5 minutes, stirring occasionally. 2. Add the garlic, ginger and spices to the pan and cook gently for a further 2 minutes until they become fragrant. 3. Add the sweet potatoes and stock and bring to the boil, then reduce heat and simmer gently for 10 to 15 minutes, stirring occasionally until the sweet potatoes are tender. 4. Add the chickpeas and okra to the pan and cook uncovered for a further 5 minutes (adding a little water if the mixture becomes dry and sticks). Season with salt and pepper. 5. While the tagine is cooking, prepare the couscous by putting it in a bowl and covering with 150ml of boiling water. Leave it to stand for 5 minutes until tender, then stir in the fresh coriander and parsley. 6. 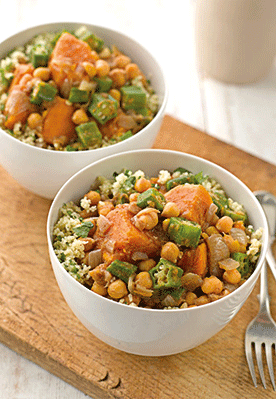 Serve the tagine over the couscous in bowls.